a person in charge of the conveyance. EWB is a twelve digit (12) number. Section 68 of the Central Goods and Services Tax Act, 2017 read with Rule 138 of CGST Rules, 2017 deals with the provision relating to E-Way Bill. 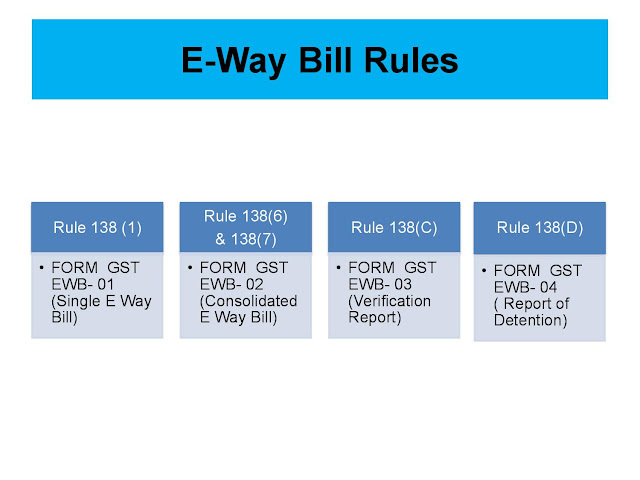 If e-way bills, wherever required, are not issued in accordance with the provisions contained in Rule 138 of the CGST Rules, 2017, the same will be considered as contravention of rules. As per Section 122 of the CGST Act, 2017, a taxable person who transports any taxable goods without the cover of specified documents (e-way bill is one of the specified documents) shall be liable to a penalty of Rs.10,000/- or tax sought to be evaded (wherever applicable) whichever is greater. As per Section 129 of CGST Act, 2017, where any person transports any goods or stores any goods while they are in transit in contravention of the provisions of this Act or the rules made there under, all such goods and conveyance used as a means of transport for carrying the said goods and documents relating to such goods and conveyance shall be liable to detention or seizure. The GST council, in its 26th Meeting held on 10.03.2018 at New Delhi has decided to implement the e-way bill for inter-State movement of goods across the country w.e.f 01.04.2018. The Central Government Vide Notification No.15/2018-Central Tax Dated 23-03-2018 has notified 1st April 2018 as the appointed date. The Central Government has notified www.ewaybillgst.gov.in as the Common Goods and Services Tax Electronic Portal for furnishing electronic waybill. This portal is managed by NIC. Registration on the portal merely refers to the creation of user login for use of the features on this portal. 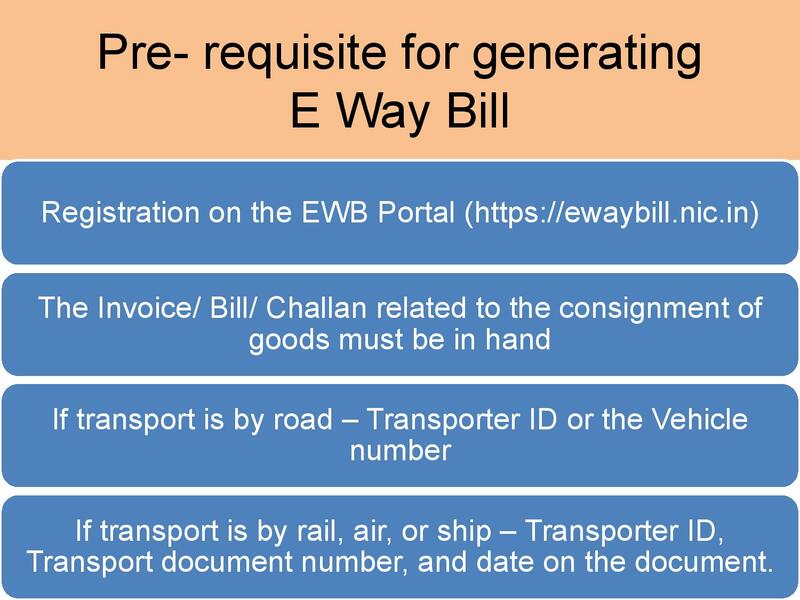 Registration on www.ewaybill.nic.in is not to be understood as registration under section 22 of CGST Act, 2017 because persons who are already registered under section 22 are also required to register on this portal. All the registered persons under GST shall also register on the portal of e-way bill namely: http://ewaybill.nic.in using his GSTIN. Once GSTIN is entered, the system sends the OTP to his registered mobile number and after authenticating the same, the system enables him to generate his/her username and password for the e-way bill system. After generation of username and password of his choice, he/she may proceed to make entries to generate e-way bill. There may be some transporters, who are not registered under the Goods and Services ax Act and if such transporters causes the movement of goods for their clients, they are equired to generate the e-way bill on behalf of their clients or update the vehicle number for e-way bill. Some business may have multiple branches within a state. Under these circumstances, the main user can create sub-users and assign the roles to them. He can assign generation of EWB or rejection or report generation activities based on requirements. For every principal/additional place of business, user can create maximum of three (3) sub-users. For each invoice, one EWB has to be generated, irrespective of same or different consignors or consignees are involved. The temporary number generated after filing PART-A shall be valid for 15 days fou pdation in PART B.
E Way bill may be cancelled electronically on the common portal/ through SMS within 24 hours of generation, provided it has not been verified in accordance with Rule 138B. 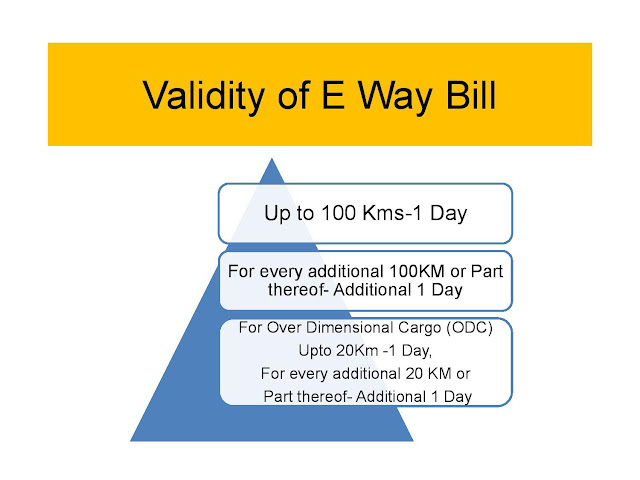 E-way bill is required only in the case of movement of goods of consignment value exceeding Rs.50,000/-. Transactions involving goods are sometimes treated as a supply of services. 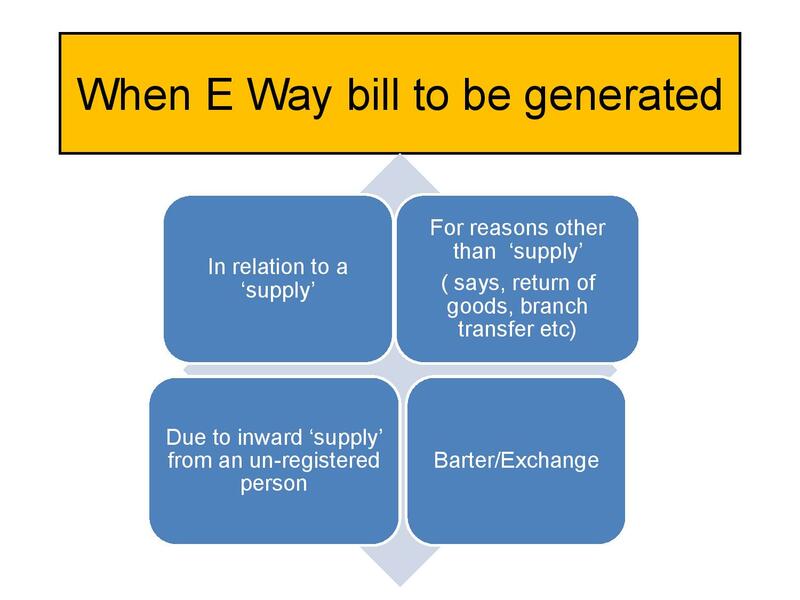 The e-way bill is required not only when the supply is treated as a supply of goods but even when the supply is treated as a supply of services but involves “movement of goods” such as lease of goods, supply of food/drinks etc. Provided that where the goods are transported by railways, the railways shall not deliver the goods unless the e-way bill is produced at the time of delivery. The consignment value of goods shall be the value, determined in accordance with the provisions of Section 15, declared in an invoice, a bill of supply or a delivery challan, as the case may be, issued in respect of the said consignment and also includes the GST, if any, charged in the said document but shall exclude the value of exempt supply of goods where the invoice is issued in respect of both exempt and taxable supply of goods. 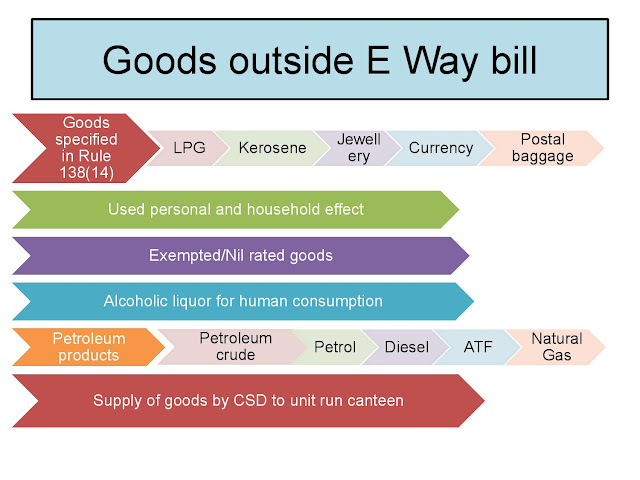 For certain specified Goods, the e-way bill need to be generated mandatorily even if the Value of the consignment of Goods is less than Rs. 50,000. Inter-State movement of Goods by the Principal to the Job-worker. Inter-State Transport of Handicraft goods by a dealer exempted from GST registration u/s 24(i) &(ii). As per Rule 138(3) the registered person or, the transporter, may, at his option, generate and carry the e-way bill even if the value of the consignment is less than fifty thousand rupees. At present E Waybill is required only for interstate (Other State) movement of goods having consignment value more than Rs.50,000/-. Limit of Rs.50,000 shall apply to each consignment…Not on value of goods in a carriage. Transportation of goods upto a distance of 20 kilometers from the place of the business of the consignor to a weighbridge for weighment. Transportation of goods from Custom port/Airport to Inland container depot & back. Where the distance between the consigner or consignee and the transporter is less than 50 Kms and transport is within the same state. The person to whom the information under Rule 138(11) in Part A of FORM GST EWB-01 is made available has to communicate his acceptance or rejection within seventy two hours of the details being made available to him on the common portal, or the time of delivery of goods whichever is earlier, otherwise it shall be deemed that he has accepted the said details. 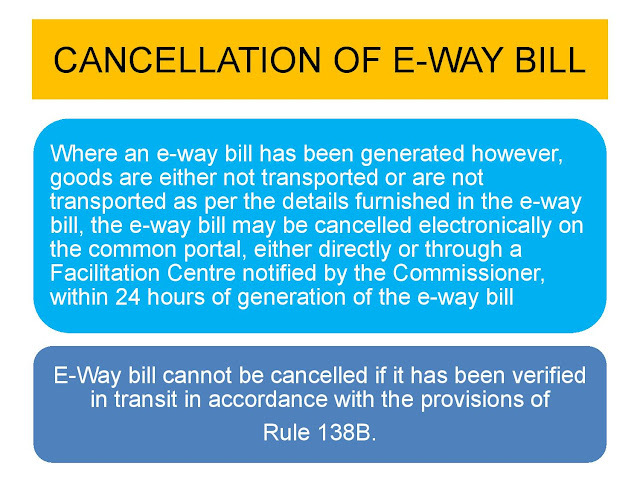 An e-way bill once generated cannot be deleted. However, it can be cancelled by the generator within 24 hours of generation. Consolidated EWB does not have any independent validity period. Individual consignment specified in the corresponding EWB in the Consolidated EWB should reach the destination as per its validity period of that individual EWB. If validity of the e-way bill expires, the goods are not supposed to be moved. 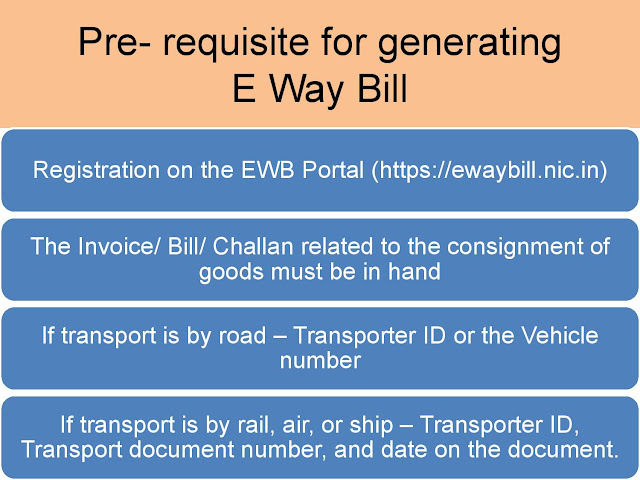 However, under circumstance of ‘exceptional nature’, the generator of the e-way bill can generate another e-way bill, by entering the e-way bill number and part-B. Now, the system generates the new e-way bill with Part-A information of previous e-way bill and new Part-B information. If one invoice transported through different vehicles. The person in charge of each vehicle shall carry delivery challan of that portion & certified copy of the invoice. E Way of that portion which is transported in said vehicle to be generated. 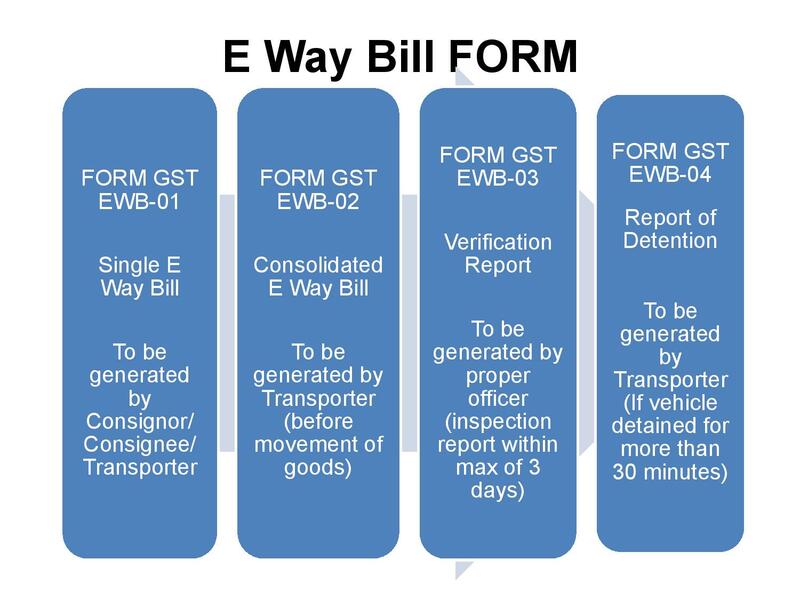 One e-way bill can go through multiple modes of transportation before reaching the destination. As per the mode of transportation, the EWB can be updated with new mode of transportation by using ‘Update Vehicle Number’. E Waybill will abolish the check post system. 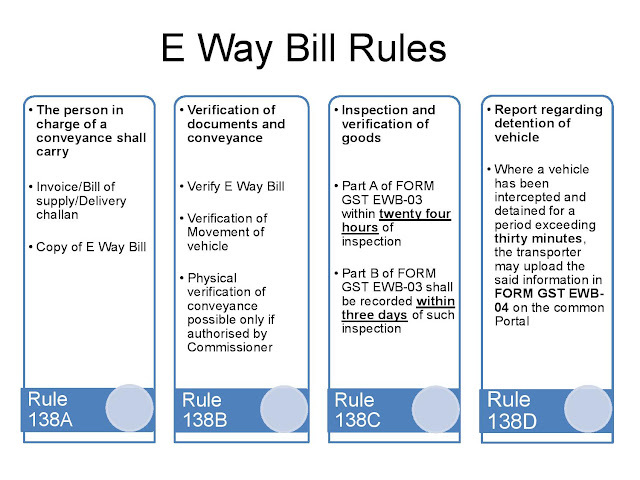 An uniform e-way bill rule will be applicable throughout the country. It will help the logistics industry by increasing the average distances travelled, reducing the travel time resulting in lower cost of transportation.